My final event of the year on Googie started fantastically with a super dressage test leaving us in 20th out of 90 in the CIC2* at Bicton. Followed by a foot perfect round show jumping. Cross country was going really well, we were up on our minutes and came to the third last fence, which was the water. It was a huge one stride double into water. I steadied her and then rode positively thinking that she would back off once she saw the water! But she did not and tried to bounce the double, which ended up with me being rather soggy! I would have been 5th which makes it even more annoying, but that is eventing I guess. I can not be disappointed as she is back flying round Intermediates and Advance level after her injury (broken tail). Pooh is as ever perfect, but annoyingly she has tweaked something in the field and has had several scans and X-rays. They are all clean, so she is having a extra long holiday. She is looking so well with the thanks to the Dengie team, just very fluffy!!! Ziggy is on a well deserved months holiday. He has been busy doing lots of hunter trials and dressage. We went to the BD Area Festival and finished 4th with 68% and qualified for the Semi-Final. We scored 68% again and was lying in 3rd with only 3 qualifying for the final, but sadly got pushed into 4th after the last rider in the class…typical! 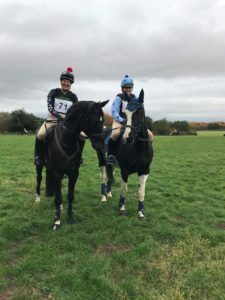 We have also been doing hunter trials and he is really getting the hang of it with the thanks to Sydney Hockney and her awesome horse Lightning who had the patients to be the best lead round a couple of pairs classes. He then followed those by going around on his own. His last hunter trial we did two classes on our own and in the 90 he unexpectedly won!! While they are all having a little down time I have been making big changes in my life. I left Judy Harveys after 10.5 months. I had the most amazing time there and learnt so much. I got to a point where I felt that I was letting my horses down by not jumping enough! If I was a dressage rider, no doubt I would have stayed. I have now started a new job with the Irish event rider Sam Watson. 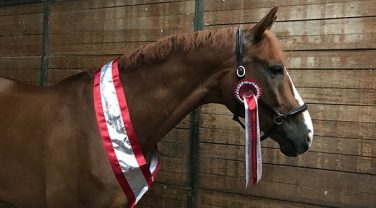 Sam was part of the Irish team at WEG (World Equestrian Games) who won team silver, this was 40 years after Sam’s Dad won an Individual silver medal and Sam then became the first Irish eventer to be in the top 10 world rankings. I am on Day 3 and am getting into the swing of things. So far it is beyond what I expected, I am riding 3 or 4 horses every day and it is such a relaxed, family orientated yard. I cannot wait for Googie and Ziggy to join me. I will also be able to bring Pooh over when she is back up and running. Lastly Pogo has been up to his usual tricks! He loves going under electric fences and annoyingly went under one too many and got into Googie’s field…oops! Googie did not think much of his visit and kicked him in the face and he has just had his staples out.